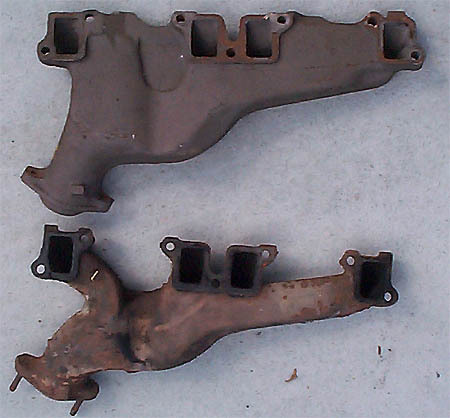 The top manifold is from a 67 Electra 225 with a Buick 430. 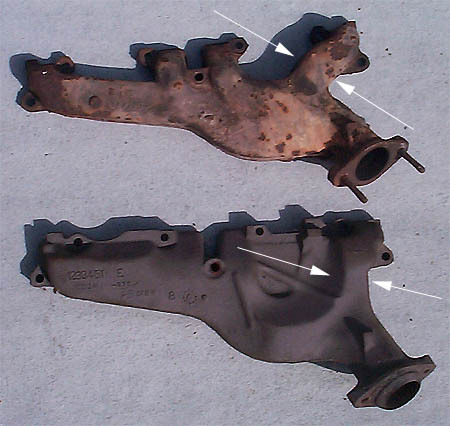 The bottom manifold is from a 1972 Electra with a 455. The 67 manifold appeared only in 1967. The 1968-76 manifolds are the same. The arrows indicate the major differences in the two manifolds. The 67 has about a 2" runner for #7 cylinder while the 68-76 version are only about 1.5". The 67 manifold is about 10-15% more efficient. We will have a dyno test comparing the two exhaust manifolds to determine a difference in torque and horsepower. Also, notice the 67 doesn't have a circular donut for the exhaust pipe to connect to since the 67 cars had a heat-riser which had the donut on it. So, you will need to have an exhaust shop make an adapter for you or use a composite donut to seal the pipe to the manifold. Here is a back side comparison of the two manifolds. The 67, bottom, is shaped more like a header.